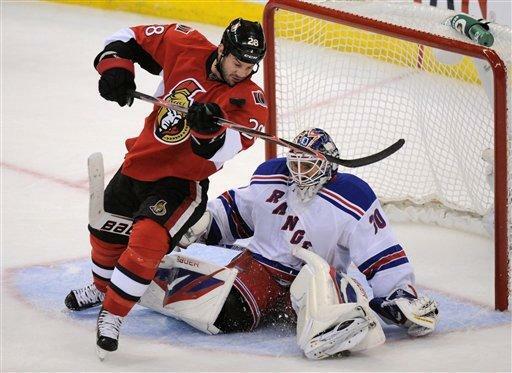 OTTAWA (AP) Henrik Lundqvist made 39 saves for his fourth NHL playoff shutout, and Brian Boyle scored for the third straight game to break a third-period tie as the New York Rangers beat the Ottawa Senators 1-0 on Monday night. 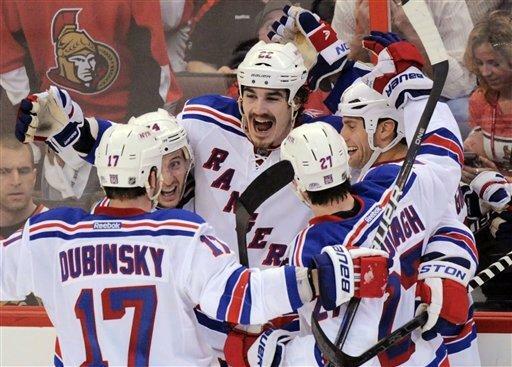 The Rangers, who lost Game 2 at home in overtime, lead the best-of-seven, first-round series 2-1. Game 4 will be Wednesday night in Ottawa before the series returns to New York. Lundqvist's biggest save came in the last minute when he robbed Kyle Turris on the doorstep with a quick pad stop. Craig Anderson was nearly as good, keeping the Senators in it with a 22-save effort. Ottawa was without captain Daniel Alfredsson, who sustained a concussion in Game 2 when he was elbowed in the head by Rangers rookie Carl Hagelin. Hagelin served the first of a three-game NHL suspension for the hit. Bobby Butler replaced Alfredsson. Chris Kreider, who nine days earlier won the NCAA championship with Boston College, made his NHL debut in place of Hagelin. The Senators dominated play early in the third period, forcing Lundqvist to make a number of saves. But it was the Rangers who scored the only goal of the game. Boyle took a rebound off the side of the net and backhanded a shot past Anderson to break the deadlock at 7:35. With 7:09 remaining, the Senators went on the power play, but it was short-lived because Chris Phillips took a slashing penalty on Boyle, who had a breakaway opportunity. The Senators dominated much of the second period, outshooting the Rangers 13-8, but the Rangers also had their chances. At 11:00, Ruslan Fedotenko's shot hit the post, but the rebound trickled across the goal line as Anderson and forward Jason Spezza dove to smother it. A video review clearly showed that the puck didn't cross the line. Lundqvist made several stops in the second as Ottawa's fourth line wreaked havoc. Jim O'Brien was denied twice, and Erik Condra and Zack Smith had great chances, as well. Turris also missed a great opportunity midway through the period. A scoreless first period featured chances by both teams, but neither was able to capitalize, despite both having power plays. Both teams have struggled with the man advantage throughout the series. The Senators haven't won a playoff game at home since Game 3 of the 2007 Stanley Cup finals - a seven-game losing streak. Ottawa is 0-3 in postseason games without Alfredsson in the lineup. NOTES: Ottawa D Chris Phillips played in his 100th playoff game. ... The Senators were without D Matt Carkner, who served a one-game suspension for punching Boyle in Game 2. ... Boyle scored only 11 goals in 82 regular-season games.